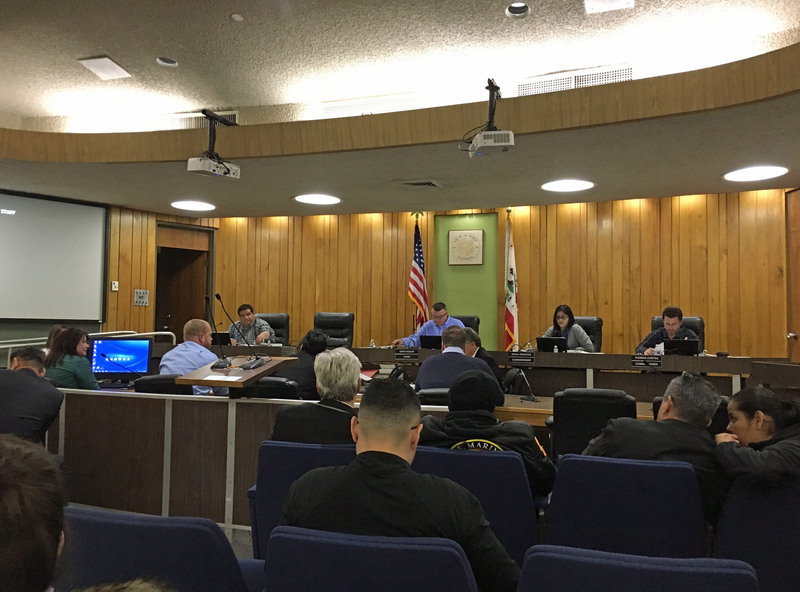 City of La Puente sets the culturally-significant Star Theatre for City Council vote on April 9th after Planning Commission voted unanimously for demolition. The City of La Puente Planning Commission met on Tuesday, March 5, 2019 for a public hearing on the proposed 22-Unit Residential Condo Project which includes demolition of the Star Theatre. 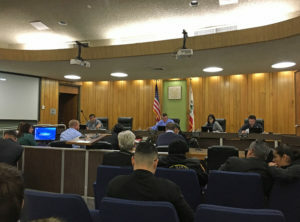 The Staff Report, recommending the Planning Commission approve the project, was outlined to the Commission along with an overview of their supporting documentation, much of which was impact analysis required by the California Environmental Quality Act (CEQA) and prepared for the city by Chambers Group, Inc. The Final Environmental Impact Report concluded that the Star Theatre is considered to be a historic resource as defined by CEQA guidelines, and that the proposed condo project will result in significant and unavoidable impacts to the city's cultural resources by demolishing the Star Theatre. To justify their position, Staff prepared a Findings of Fact and Statement of Overriding Considerations acknowledging the significant cultural and environmental impact of demolishing the Star Theatre, but choosing to support the demolition without strongly considering any real alternatives. CEQA requires cities or lead agencies to consider alternatives to the project. The report presented two alternatives, 1) a no project alternative and 2) a reduced density alternative. These included acquiring parcels to the south to develop the condos and rehab the theatre, or alternatively reducing the development to 9 condos and rehabilitation of the theatre by a non-profit or local organization. The no project alternative option requires an available buyer of the theatre with a code compliant restoration, of which they proposed a rehab cost of $1million to $25million. They deemed this not feasible due to the cost of the rehab and lack of financial reassurances from a group or organization to fund this effort. LAHTF addressed multiple issues with how the project had been approached, including the city not following the State of California CEQA requirements for the project until it was pointed out to them by the LA Conservancy that it was a legal requirement. The city did not attempt to find appropriate case studies befitting this theatre and community, nor organizations with substantial resources to provide an alternative development plan. They also failed to actively look for a potential buyer, group or organization to purchase the theatre and complete a restoration. Rehabilitation costs for other comparable theatres included venues on a completely different scale to the Star Theatre, in what appears to be an attempt to skew potential rehab costs into much higher dollar ranges. In addition, LAHTF presented findings of financial impacts to local businesses based on the national average of a theatre audience’s spending habits. Of the speakers during public comment, half were in favor and half objected to the project. One public speaker opposed to the project questioned the transparency of sale of the parking lot included in the development that the City had once owned. Most public comments in support of development were focused on the theatre being an eye-sore or unable to see past the adult movie past, while seeing demolition as the only option. Upon the conclusion of public comments, the Planning Commission bypassed any discussion on the report or public comments and concerns going straight in to voting unanimously to support the project and demolition of their culturally-significant Star Theatre. The Planning Commission's recommendation will be presented to the City Council at the Tuesday, April 9th meeting, and Council will have the final vote on whether the project is granted approval. LAHTF will be present and will continue to advocate for saving and revitalizing the Star Theatre. 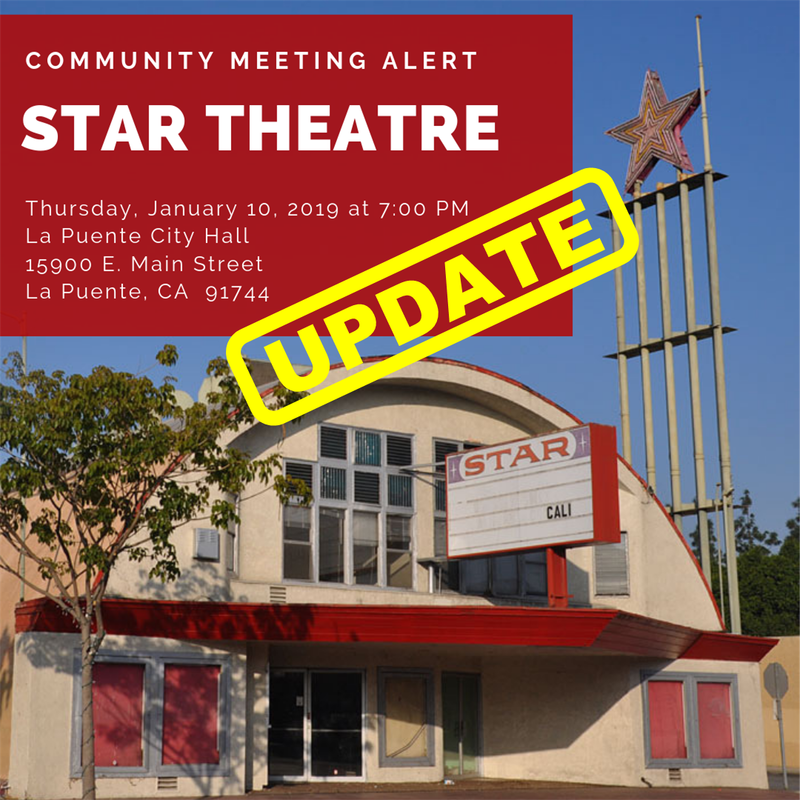 City sets Planning Commission Meeting for the proposed demolition of the 1947 Star Theatre in La Puente, designed by master architect S. Charles Lee. 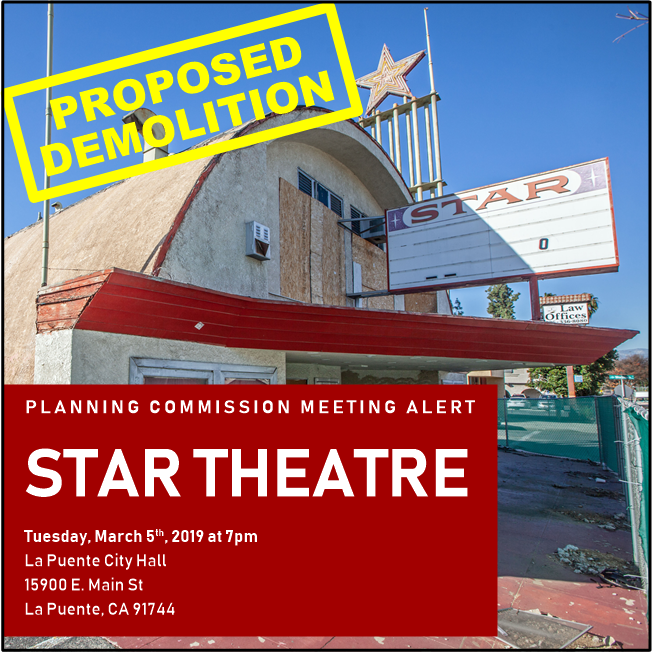 The City of La Puente’s Planning Commission will meet this Tuesday, March 5th at 7pm, to hold a public hearing on the proposal to demolish the Star Theatre in order to construct 22 condominiums and associated parking. 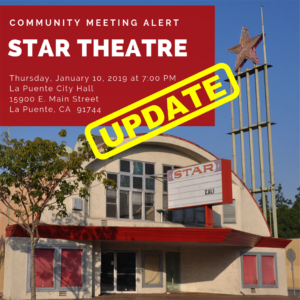 LAHTF is disappointed that the Staff Recommendation to the Planning Commission is to DEMOLISH the Star Theatre and will attend the meeting to object to the demolition. Interested parties are encouraged to attend the meeting to support the Star Theatre and make a statement if desired. Should you wish to submit a statement but cannot attend the meeting you can email John Di Mario, the city’s Development Services Director, at jdimario@lapuente.org before Tuesday’s meeting. See below for LAHTF's full position statement and a rundown of the community meeting LAHTF attended in January. Detailed project documents are available here on the City of La Puente's website. Click here to read a summary of the community meeting which LAHTF attended and spoke at. Scroll down for LAHTF's position statement on the proposed project. The Focused Draft EIR and other project documents are available on the City of La Puente's website here. Public comments are welcomed by the deadline of end of day, January 25th 2019. Comments may be submitted to John Di Mario (Development Services Director) by FAX to (626) 961-4626 or by email to jdimario@lapuente.org and must include "22-Unit Residential Condominium Project" in the subject line. Comments may also be submitted by mail, postmarked no later than January 25th 2019, to John Di Mario, Development Services Director, City of La Puente, 15900 East Main Street, La Puente, CA 91744. 22-Unit Residential Condominium Project proposed to replace the 1947 Star Theatre and adjacent surface parking lot. The owner of the Star Theatre has submitted a proposal to demolish the theatre in order to build 22 condominiums with associated parking on the site and adjacent surface parking lot. The Los Angeles Historic Theatre Foundation has reviewed the Focused Draft Environmental Impact Report (EIR) for the project. We are disappointed that the City, property owners, and EIR authors did not seriously consider alternatives that would save and reactivate the Star Theatre. We acknowledge the serious need for housing in our region, at the same time we feel that providing arts and culture is vital for our quality of life. La Puente is vastly underserved when it comes to the arts. There are no theatres of any sort within the city boundaries, and the nearest movie theatre is 4 miles away in the City of Industry. Theatres create cultural and social centers, and help drive the economy of the community. Nearby retail is always helped by an operating theatre. Nationally, for every ticket purchased, an additional $30+ is spent in the surrounding community. In addition to the financial benefits, the cultural benefits are priceless. Children with exposure to the arts develop interests and passions that last a lifetime, and end up learning more about their own culture, history and community. There is mention of transient crime at the subject property, and the assumption is made that demolishing the Star Theatre and building the condos will be required to alleviate the problem. There is no mention of the fact that reactivation of the theatre would have the same positive effect, and might have a more positive effect on the broader community. This is a shortsighted opinion clearly made to support the proposed project as the “only” viable option. The assumption is made that the only way to have housing alongside the theatre is to separate the property. This is not true. There are many examples of a theatre being integrated into a project, and even sharing parking. The assumption that parking requirements are a problem is also not true. Many, if not most historic theatres have no dedicated parking, so they create shared-use contracts with nearby businesses. This can be written into the Conditional Use Permit for the theatre’s operation. If there is a will there is a way. There is no documented attempt to reach out any further than one local arts group, while there are multiple national and regional organizations specializing in historic theatre restoration and activation, and each organization maintains networks of arts organizations that could potentially have been brought in. We find a lot of questionable assumptions based on incomplete information. Again, if there was a concerted effort to look at this alternative, there are plenty of case studies. Instead, rehabilitation costs were based on a crowd-sourced website, not on any professionally gathered information from reputable sources. The rehabilitation range of $10 to 26 million is absurd. We know of two theatre restorations going on now in the LA County. Both are larger than the Star, more complex architecturally, and were vacant for about the same amount of time. Each are estimating a total rehabilitation cost of closer to $2 million, a fifth of the low end of the estimate in the EIR for the Star Theatre. There are two directly relevant case studies in the Southern California area. Both were vacant for close to a decade. Both are in areas with similar median household incomes. The Bay Theatre in Seal Beach was built as a movie theatre and is slightly larger than the Star. After sitting empty for almost 10 years it was bought by a developer who specializes in historic buildings, and he is personally restoring it at an estimated cost of $2 million and will reopen it as a venue for movies and live entertainment. The Star Theatre in Oceanside sat empty for years after being an adult theatre. Now restored and reactivated, it is the home of live theater, movies, ballet, music, youth arts education, and other community events. LAHTF would be pleased to share tangible examples of the case studies and further information on key points with city officials and the project team. The Star Theatre is a rare surviving post-war design by noted master architect S. Charles Lee. The lamella roof construction is an example of Lee’s adaptive use of changing architectural trends and techniques, using an innovative solution to construct a building that avoided lingering post-war restrictions on building materials. It is the only remaining example of this type of work by Lee in Los Angeles County, and one of only three such examples remaining in California. The theatre is also notable for its monumentally sized signage, designed to attract patrons from a distance and particularly those in automobiles. It is unique in its dual function as both a neon sign and a flagpole, in addition to its size and scale as it relates to the building it advertises. It takes patience and determination to do the right thing for the community and the property owner. Rushing to tear the Star Theatre down to build housing is an uncreative solution that will be a loss for the community. We urge the city and developers to reconsider, and seek more reliable information before determining that the Star Theatre has no future. We think with a little creativity the Star Theatre can be reopened along with new housing, and both can have a positive effect for many generations. The Star Theatre opened in 1947 as a 599-seat single screen theatre, designed by celebrated theatre architect S. Charles Lee. In Los Angeles, Lee had previously designed the extant Tower Theatre (1927), the Fox Wilshire, now Saban Theatre (1930), the Academy Theatre (1939), and the Los Angeles Theatre (1931), along with many smaller theatres and projects in other States. The Star Theatre features a wooden lamella roof (also known as a Zollinger roof) that utilizes roof timbers arranged in a diamond-shape pattern to span large spaces without other means of support. The use of timber in this innovative arrangement also avoided lingering post-WWII restrictions on building materials. Instead of covering-up the roof timbers, Lee emphasized them by leaving them open to the interior, creating a pleasing geometric pattern on the ceiling of the theatre. The Star is one of only three remaining buildings of this type designed by Lee, and is the only example in Los Angeles County. In 1978 the theatre changed to screening adult films. However in 2001 some renovation work took place and the Star changed to screening first run family-friendly movies with Mexican subtitles, and sometimes live performances. The theatre fell upon hard times in 2007 and has been closed ever since. Historic photos courtesy S. Charles Lee collection, UCLA. Other photos copyright LAHTF.